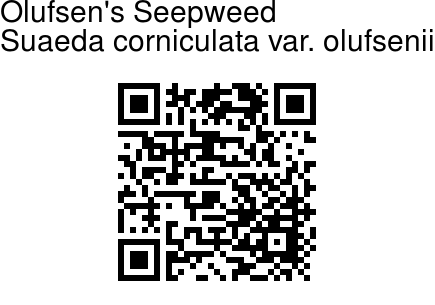 Olufsen's Seepweed is an annual herb, spreading into a 5-10 x 1-10 cm expanse. It is very variable in habit, prostrate or rising, rarely erect, primary stem usually equalled by some longer basal laterals. Living plants are glaucous green, often purplish. Stem is much and repeatedly branched from base, only in dwarfed specimens unbranched, at base up to 2 mm thick; when young, with alternating green and pale or purplish lines, later turning straw-colored. Leaves are few, often very succulent, semi-terete, linear to oblong, 5-10 x 0.8-1.2 mm. Bracts upwards gradually shorter and changing in shape to narrow ovate, higher up to broadly ovate and even almost circular, shortly mucronate, usually longer than glomerules, except for the uppermost. Bracteoles 0.5-0.7 mm long, narrow ovate or obovate, acute or acuminate, the margins in upper part eroso-dentate. Glomerules are 3-11flowered, axillary, in case of luxuriant growth clusters with up to 30 flowers and the flowers arranged along short bracteate or ebracteate branches that arise in pairs beside the primary axillary flower; with flat base and strongly eccentric hilum, the tepal lobes highly succulent, incurved, much higher than the centre of the flower, fused for 1/2-3/4, with 1 tepal much longer and wider and 1-2 somewhat larger than the others. 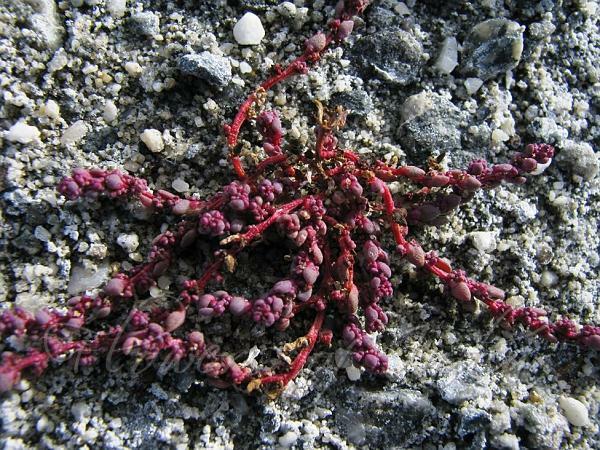 Olufsen's Seepweed is found in the Himalayas, from Afghanistan to Tibet, in salt-marshes around permanent or temporary lakes and in depressions with saline soils in the alpine semi-desert zone at altitudes of 3500-4800 m. Flowering: July-September. Photographed near Pangong Lake, Ladakh.